This sixth century monastic site, located on the banks of the River Shannon is home to three high crosses, a cathedral, seven churches and two round towers. This great monastery was founded in 548- 9 by St. Ciarán Mac a tSaor (“son of the carpenter”), who studied under St. Finian at the famous Clonard Abbey. The strategic location of the monastery at a crossroads between the major east-west land route through the bogs of central Ireland and the River Shannon helped it become a major centre of religion, learning, craftsmanship and trade by the 9th century. Clonmacnoise was a centre of learning excellence, and many manuscripts, including the including the Annals of Tighernach (11th century) and the Book of the Dun Cow (12th century), were written here. The monastery flourished for 600 years as a centre of learning and religious instruction as well as providing much of Ireland’s finest Celtic art and illuminated manuscripts. The surrounding area of Clonmacnoise is a microcosm of landscapes within the Midlands. These include the Shannon callows, eskers, boglands both preserved and cutaway. Alongside the ruined churches and round towers are three ancient high crosses; two are complete high crosses plus the shaft of another. Now protected from the vagaries of Irish weather in the site’s excellent visitor centre, convincing replicas stand in their original locations. The most famous is the four-meter Cross of the Scriptures, whose sandstone is skillfully carved with intricate figures on all four sides. The Cross of the Scriptures was mentioned twice in the annals of the Four Masters, first in 957 and later in 1060. At the centre of the head on East face is the Last Judgement, and at the top of the East shaft is a panel showing Christ with Peter and Paul. Below this panel are two more panels bearing iconography that is still open to interpretation. On the base are three riders facing left and two chariots facing right. At the bottom of the shaft is an inscription that has now become almost impossible to see: Or do Colman Dorrro……Crossa ar Rig Flnd, A prayer for Colman who had the cross erected on King Flann. The site is entered through the visitor centre, where a number of crossslabs are displayed. The centerpiece of the visitor centre is the Cross of the Scriptures and the long and varied history of Clonmacnoise is recounted in an audiovisual presentation. Multi-lingual guided tours of the site are available and there are also exhibitions that deal with the flora, fauna and landscape of the region. 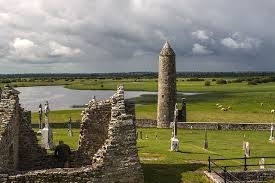 But you don’t have to be a history buff to simply enjoy the peace and tranquillity of Clonmacnoise, nestling as it has done for centuries past, on the banks of the majestic Shannon. No visit to Offaly would be complete without a visit to this most special of destinations – even Pope John Paul II stopped by when he visited Ireland back in 1979.